I’ve wanted to visit Crater Lake National Park for a long time. Having planned my visit to Washington state as a road trip, I planned a two-night stay in the park on the way back. The original plan was for me and my two sons to camp, but we ended up adding my brother-in-law and one of my nephews to the mix, too! Despite nearby wildfires creating a lot of smoke in the area, we went ahead and did this summit hike up the volcano known as Mount Scott. I’ve wanted to visit Crater Lake National Park for a long time. Having planned my visit to Washington state as a road trip, I planned a two-night stay in the park on the way back. The original plan was for me and my two sons to camp (my wife had to be at work), but we ended up adding my brother-in-law and one of my nephews to the mix, too! Despite nearby wildfires creating a lot of smoke in the area, we went ahead and did this summit hike up the volcano known as Mount Scott — the highest point in Crater Lake National Park. This part is easy. Using the NPS Crater Lake map or your favorite map/navigation app (assuming you’ve downloaded offline maps), drive to the trailhead. We drove up from the Mazama Campground—about a 25 minute drive. Our hiking crew was two adults and three kids. The smoke in the air wasn’t as bad as the day before, and it wasn’t too hot. There’s a nice sign at the beginning of the hike, giving an overview of the route and general facts. The hike actually starts out with a slight downhill section. Looking at the big hill you’re about to climb, the views are wide open and amazing. There was quite a bit of smoke in the air, but we found the views still quite awe-inspiring. As you can imagine, the going isn’t super-fast with three young kids, but we made steady progress. After the short downhill section leading to the mountain, the trail begins to climb steadily and at a very manageable grade. As the trail climbed, I hoped to get a view of Crater Lake itself. Unfortunately, it was hidden in the smoke. Looking for Crater Lake – it’s out there somewhere! 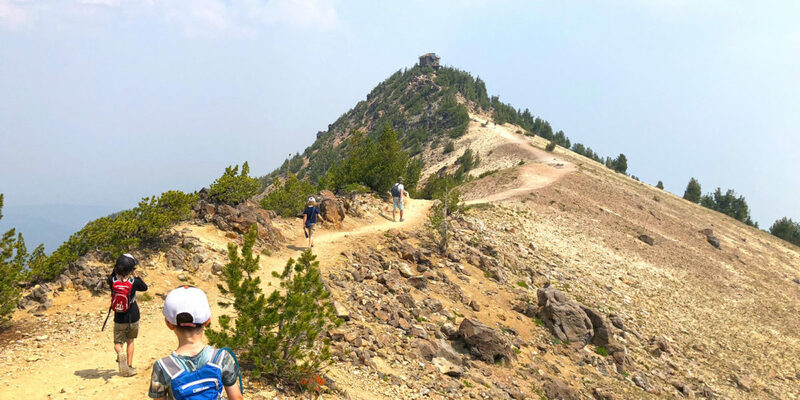 Once the trail is on the summit cone itself, it does a lot of switchbacks to maintain the gentle climb before finally rounding one last corner onto the summit ridge. Once there, you can see the lookout at the top and get excited about arriving at the top! Everyone in our little crew was quite happy to make it. A few minutes later with one last little climb to the summit! We all went to the north side of the lookout to get some shade and eat our lunch. There’s a pretty sharp drop-off on both the east and west sides of the summit, so my bro-in-law and I asked the kids to stay back from the edge just a bit! After I got a quick bite, I continued north on the summit a bit, pushing through a couple of small trees. This looked like a good place to set up, so I did so. I had a couple of different antennas with me, but opted for the end-fed half-wave antenna. I tossed it up over one of the short trees and ran it mostly horizontally to a nice spot in the shade. I seemed to be having trouble getting the antenna to tune, but thought I saw the SWR light dip a bit (you’re supposed to find the dimmest). I went with that and started calling CQ after spotting myself. After calling CQ several times, I noticed I hadn’t connected the antenna wire to the matching unit! I was probably torturing my radio and effectively emitting next to nothing in terms of RF. I connected the wire, tuned up again and things sounded much better. Right away I started getting answers, then noticed my logging app (VK Port-a-log, which I was now using for the second time) wasn’t doing anything when I tapped “save.” I tried several times, but nothing! While I had other stations attempting to call me, I desperately tried to remember the Q-code for “standby” (QRX)! Failing that, I went silent (sorry chasers!). I quickly grabbed my other phone and opened the HamLog app. If this failed, I always have pencil and paper with me, just in case. But it worked. I was rapidly back in business. I quickly worked 6 stations on 40m CW, then switched to 20m. I relied on RBN to spot me there, and quickly got 5 more contacts. Thanks, Chasers! I packed up and went to check on the rest of my crew. They’d apparently kept themselves nicely entertained while I did the activation. We applied some more sunblock and started our hike back down.